manufacturers Of On-line UPS System, Inverter, C V T .
ASEEM POWER TEKNEEKS PVT. 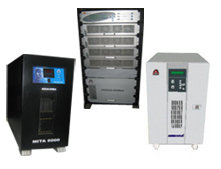 LTD. is engaged in manufacture, sales and service of UPS systems. Inverters, Converters, Chargers, Constant Voltage Transformers, Ultra Isolation Transformers and other type of power supplies. The company, through continuous development tries to maintain the reputation of "ASEEM-OORJA"® products. This reputation is built up in last 20 years. ‘ASEEM-OORJA’ is a trusted brand of many in the field of Power. ‘ASEEM-OORJA’ UPS is acclaimed as reliable & rugged power system backed up with a 24 X 7 prompt service. ‘ASEEM-OORJA’ UPS is the choice when you need safe power for your sensitive gadgets. Our clients range from Banks, Institutions, Corporate sector, Government Sector to small offices, shops etc.